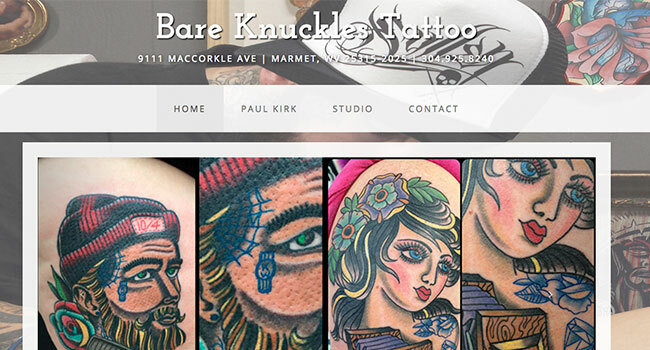 Problem –Client did not have a website for their tattoo studio. They only had an online listing in the West Virginia Yellow Pages which was very basic and did not showcase any of their artists or artwork. Goals & Objectives –To develop the studio’s online presence with a website that can showcase the artists, their work, give information about setting appointments, and general information. The site needs to work on both desktop and mobile devices. Since there was no current statistics or analytics to use we checked the studio’s local competitor’s sites, rankings, and analytics to get a base line for what the visitor’s demographics are. Solution –We designed a site using the Bootstrap Framework and PHP. The site contains 5 pages - Home Page, Paul Kirk, Studio, Contact Us, and Thank You. The Contact page is designed to give the visitor all the information about the shop including the hours, location with map, and a form to request more information or set an appointment. The form is then automatically sent to the shop owner’s email address and the visitor is sent to a Thank You page where they are provided a quick message before being redirected back to the home page.